Is it just me, or is the 2nd Edition doll noticeably darker than the original? I wonder what happened in those fourteen years to make Mattel want its doll to represent and appeal to a different, broader range of young South Asian girls (including me, because I think this is the one I had and might still have lying around somewhere)… Also, the 2nd edition doll is presented in a much more noticeably “ethnic” context (the Taj Mahal, of course). The 1982 edition is described as wearing a “three-piece sari, including a long rusty red skirt, matching wrap, both trimmed with golden thread, and golden halter-top.” Uhh, sorry, but that’s not a sari… it’s a skirt, a halter top, and a shawl. A sari is a looong singular piece of cloth wrapped around the body in different styles. Great job, Mattel. I’m not the only one debating the authenticity of Mattel’s descriptions about its ‘Dolls of the World.’ Nirali Magazine points us toward a discussion by several Indian-American writers/bloggers/professors about the Diwali Barbie Doll released last year as part of the ‘Dolls of the World – Festivals of the World’ line. So at the same time that it explicitly exoticizes Indian Barbies (“far away India,” “exotic-style jewelry”) presumbably in order to differentiate them from its other products (and therefore make them more appealing to consumers), Mattel can’t seem to get the facts straight. Ironically enough, I wonder how many of the company’s products are made in India. And how young the workers in those factories may be. This entry was posted in advertising, barbie, beauty, capitalism, consumerism, diwali barbie, dolls, dolls of the world, exotic, india, india barbie, marketing, mattel, nirali magazine, race, sari, south asian, taj mahal, white standard of beauty, women of color. Bookmark the permalink. 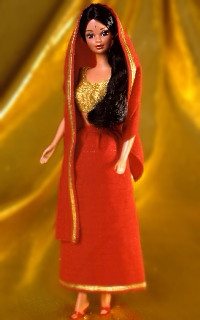 Is it just me, or does the 1982 Barbie resemble Sharmila Tagore, while Diwali Barbie has overtones of Aishwarya? Hmm…. 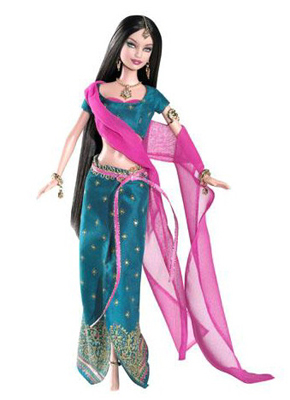 You are missing 1 more doll from Mattel that is Indian/South Asian. 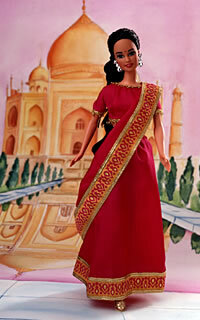 It is the “Princess of India” Barbie from 2003/2004? From their Princess of the World Series. I think She Looks like Rani Mukerjee. that is so cute i want it!!! i luv your dolls. can i get one. am a nigerian and i would like to purchase one. I still have the Second Edition India Barbie. She was my favorite when I was young and was the only one I never ‘tortured’ (I was an evil child). I always thought the darker skinned barbies were prettier than the light ones. all three of this makes me vomit!